Connecting the Past and the Future from Graphic Design Museum on Vimeo. 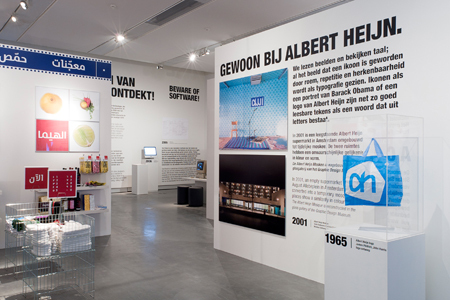 As of Saturday, January 15, 2011, my work the Albert Heijn Mosque is on display in the Graphic Design Museum (Breda, Netherlands) as part of the exhibit Connecting the Past and the Future, which will be open until May 29, 2011. In the window shop of the museum, the mosque has been rebuilt for the duration of the exhibit. 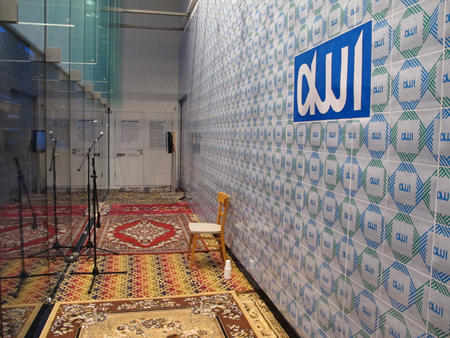 The Albert Heijn Mosque has also been added to the permanent collection of the museum. It’s a great exhibit with lots of different artists, among whom are Rem Koolhaas, Stefan Sagmeister, Maarten Baas, and Kesselskramer. You should definitely go see it! The Albert Heijn Mosque was built in 2001 in an old supermarket in Amsterdam (NL), with big windows showing the prayers to passersby. The walls of the mosque were covered with Islamic mosaics and the name of Allah, created from the logo of the Dutch most famous supermarket Albert Heijn. The prayers in the mosque were performed by imams who had especially come over from the Al Ahzar Mosque in Cairo, the Vatican of the islamic world. Their prayers were very beautiful to listen to. The praying Muslims in the neighborhood perceived the mosaic and mosque as truly Islamic. The mosque was packed at every prayer. The passersby saw Muslims praying for a supermarket logo and were confused. 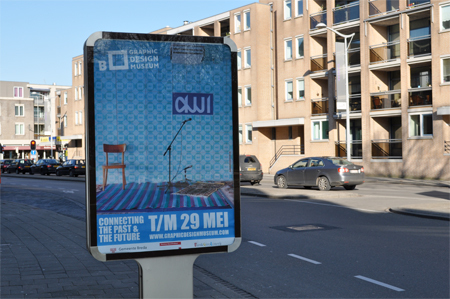 Some of the people passing by thought the mosque must have been a political action or a funny advertisement by Albert Heijn, instead of what was really happening; the artwork had turned into a real authentic mosque. 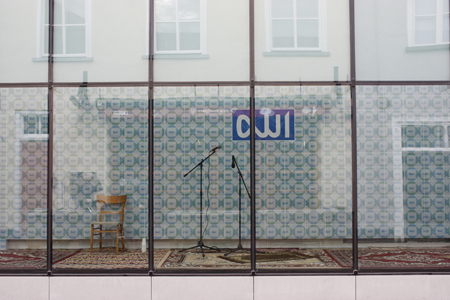 During the month Ramadan the prayers were also displayed via a live stream on a video wall, in the gallery Smart Project Space in Amsterdam. This entry was posted on Thursday, January 27th, 2011 at 12:00 am and is filed under inspired. You can follow any responses to this entry through the RSS 2.0 feed. You can leave a response, or trackback from your own site. Hello there, You’ve performed a great job. I will certainly digg it and in my opinion suggest to my friends.